Apple has determined that some units of the iPhone 7 are displaying “No Service” in the status bar even when cellular coverage is available due to a failed component on the logic board. The company has now started a repair program to fix affected iPhones for free. The affected iPhones were sold in China, Hong Kong, Japan, Macao, and the United States. Here are the affected model numbers. Look on the back for the model number. 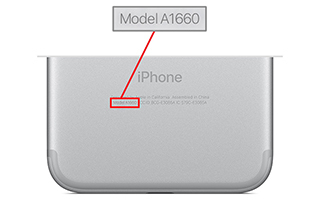 You can also find it in Settings > General > About — tap the Model field to display the relevant model number. If your iPhone 7 has one of those model numbers and is suffering from this problem, contact Apple support to schedule a free repair. If you’ve already paid to resolve this problem, Apple will contact you via email to arrange for a refund by the end of March 2018. If for some reason you don’t receive that email, contact Apple support to ask for reimbursement. Is there any way in "Settings" to determine the Model #? But seriously, is the model # hidden in Settings anwhere? It is! I've added those instructions to the article. This happened to my iPhone 7 on Xmas eve. Needed a phone right away so I bought a new one and sold the 7 as-is. I wish I knew this would become a thing. Called Apple Support yesterday and they confirmed that I’m out of luck. I have Model A1778 (not one of the listed problem models) but I think my phone has this problem as well! Definitely worth contacting Apple then! I have a model A1688 and have the problem. In fact, had it today. Sounds like the problem may be more widespread than Apple was initially suggesting. Let us know what Apple support says! Should I contact Apple even if my iPhone 7 has not yet had this problem? No, because there's no failed component to replace.